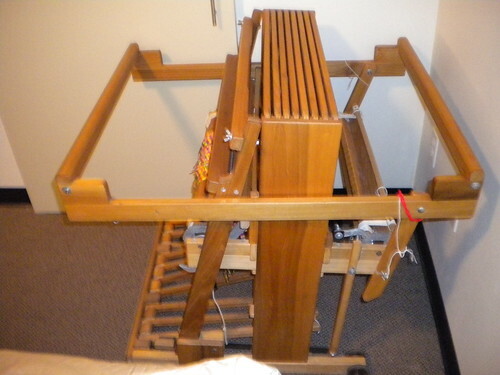 Have I have shown you my folding loom? 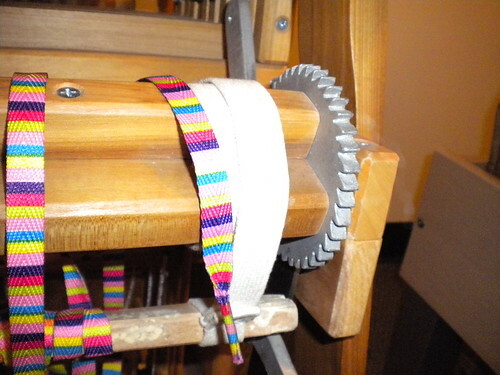 It is not the smallest folding loom- I think wolfs are smaller (which is tempting, trust me! 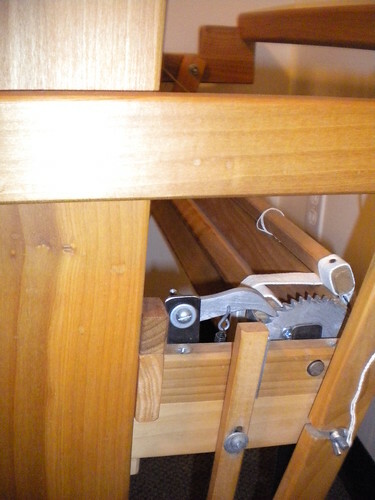 ), but it is super sturdy and lives in a corner of my bedroom when not in use. Small loom at only a 22" weaving width, it can fit in to the back of a car quite nicely (just not mine, I don't have seats that fold!) for taking to workshops or fitting snuggly in the corner of a room when not in use- not that it leaves any space in my living room, but hey, I am usually knee deep in yarn anyways! 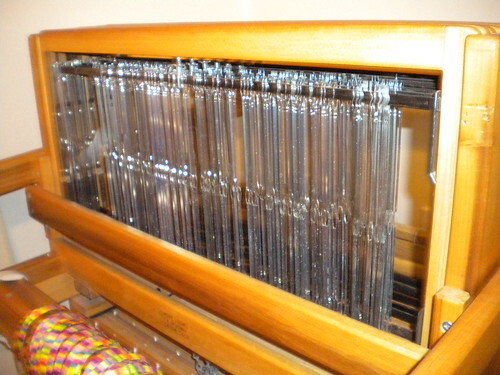 This is a first generation GEM loom by Gilmore Looms, made from poplar. Jack style. 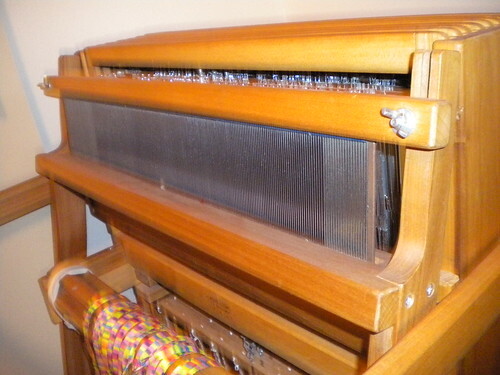 It can collapse with weaving on it (something some looms don't seem to do quite as well, though most will do it), but is still super sturdy and doesn't slide across the floor- one of my main complaints with some small looms. 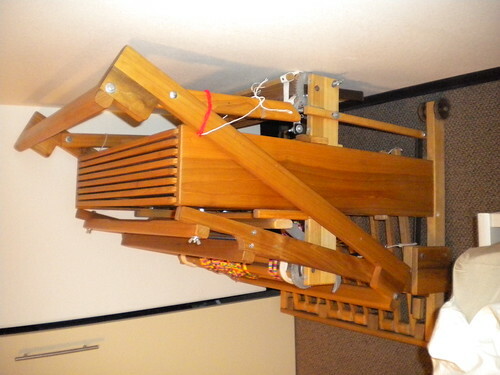 It has wheels, which was also a deciding factor in choosing my loom. Only downside? It is a bit too short for me to weave on so I tend to hit my knees a bit- if you don't have a 36" inseam like me you probably don't have this problem. The only other issue I have is more an issue with jack looms in general- the gem can hold quite a tight tension, but yarns that stick together do not do as well on it. 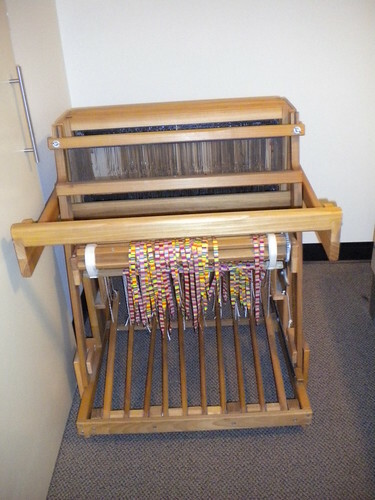 But hey, I really like the Macomber Add a Harness Looms- which besides the fact that they don't fit in my apartment (tried that with another loom! ), are too heavy for me to move myself. Which is kinf of key when warping- and yes, I warp all by myself. I won't say my tension is *perfect*, but it works. The shoestrings are for warping with, from the Warping on a Shoestring book. 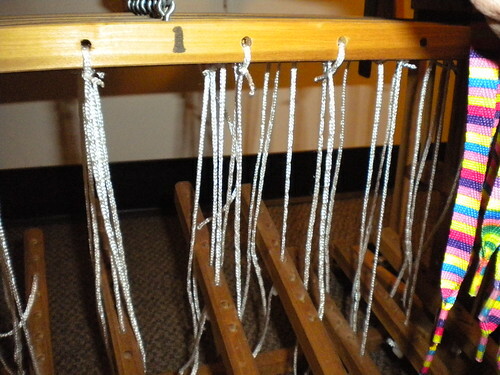 Much easier than messing with string together a bunch of knots when you can adjust each on individually. While they don't make the Gem anymore, they do make a GemII, which is almost exactly the same as far as I can tell! 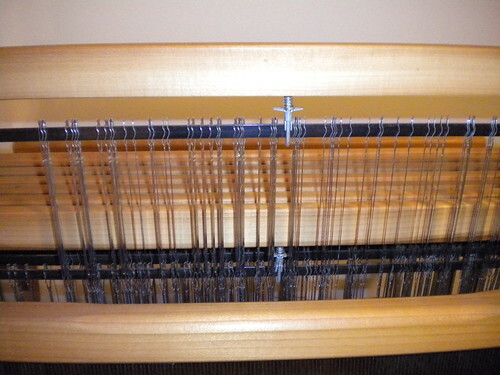 I mostly chose my loom since it could fold smaller at least, was not as expensive or heavy as many of the looms, and has a decent weaving width- something that only weaves 16 inches wasn't really going to cut it for some of the projects I have planned! Why yes...my camera DID negelect to tell me that there was no card in it for recording my most recent weaving photots! 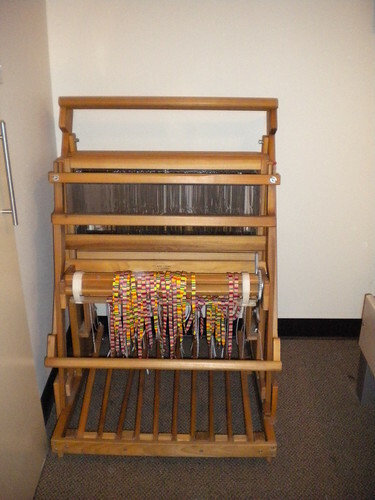 Hence the loom pics!